$2 discount per box if five or more cases are ordered. 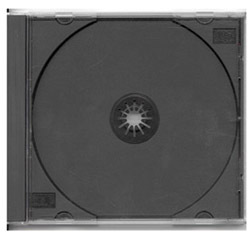 The black center panel holds 2 CDs and the two side trays hold 2 CDs each. Though it has an ultra-slender design, it still incorporates all the regular components you expect from a professional slimline jewel case. Our case is equipped with a locking hub for the disc, tray locks, and even built-in holders for your top insert. Imagine, all this packaging performance from a case that only measures 5mm thick when closed! -Closed case dimensions: 5 1/4" x 7 1/2" (1/2" thick) (approximate). Clear Full-Sleeve will hold printable insert up to 10 1/2" x 7 1/8"
Full outside clear sleeve will hold sheet up to 10 3/4" x 7 1/4"